Well I’ve done it now. I retired. Threw in the towel. Jumped the shark. Rode off into the sunset. No reason to worry about impostor syndrome anymore. Fooled them all for 33 years. By design it was a two-fer. My birthday and retirement day all in one. Once you ;e 62 your federal pension increases by 10 percent. Bueno. Also, I get to cash out my vacation days. Muy bueno. I had beaucoup vacation days because I only took 3 or 4 days off this year and, until recently, rarely took long vacations. I could have used them to take the summer off and ride cross country but I decided to work instead and do the cross country ride next year. With a fat wallet. I have a friend who would object. Do it now, she says, the future may not come. Setting aside the fact that she has put off seeing me into the future at least six times in the last 2 1/2 years, I disagree. If I can’t do it next year, it will be because I am dead. I won’t care a whole lot about riding a bike. I rode to Friday Coffee Club with a tailwind. Thank you bike gods. The conversation was pretty interesting with lots of congratulations sprinkled in. I rode to work with Lawyer Mike. We had a 13- or 14-block conversation while riding in the M Street cycletrack. After Mike peeled off, I continued on to work through a surprisingly empty Georgetown. At work, the IT staff had already left me a message. They wanted my computer and iPhone. Dang. Even vultures let the body die before they pick it clean. I put them off for a few hours, did about 10 minutes of work, said goodbye to people and called the IT folks. Okay. Come rip the technology from my cold dead hands. And they did. And I left. Will a big smile on my face. I rode off with a big smile on my face. For about a block a sense of melancholy came upon me. I cleared the Intersection of Doom turned down the hill to the river and a stupid grin came over my face. 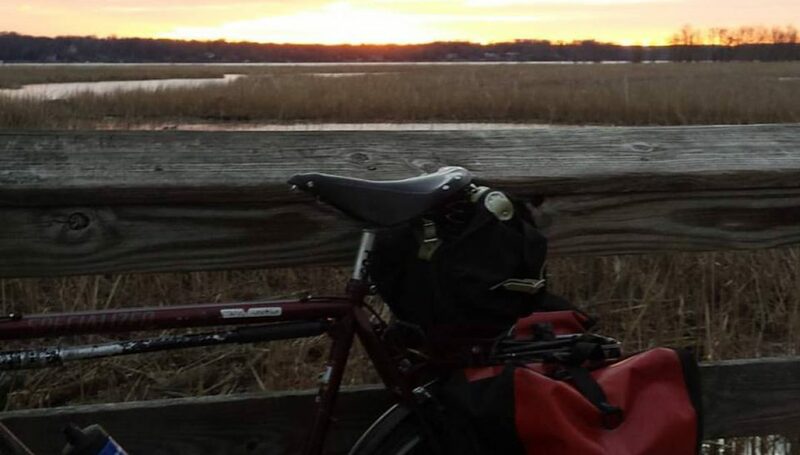 The ride back featured a gloriously breezy 1-mile ride downhill from Oxon Hill to the Potomac River. Once at the river, it was sauna all over again. I rode home on fumes. Then Mrs. Rootchopper and I drove to an outdoor happy hour in Crystal City, near National Airport. They were giving away eclipse glasses so we got some. And some beer and some pizza. We were joined by my daughter and her college friend who was visiting. And then we were joined by torrential rains. We got soaked. I was actually getting chilled. The rain let up. More beer. More pizza. Then the rains returned. The vendors said no mas and we were drove home. At home I watched a Neil Finn concert from Roundhead Studios in Auckland. It was recorded live at about 3 a.m. DC time. My favorite musician. On my Retirebirthday! Yes! And what better song to play but “Taking the Rest of the Day Off.” Perfect. After that we had cake and ice cream. I got underwear! (No lie.) A pair of socks. (No lie!) Some bug spray. (No lie!) A sleeping bag liner (redundant since I ordered one a few days before!) And the piece de resistence, a Montreal Expos baseball cap. YES!!! Not the multicolored one either. The dignified dark blue one. So cool. I’m not taking it off. Ever. Bon anniversaire! I went to dinner with friends from grad school. Birthday dinners have been a thing for us for about 30 years. It’s a pretty cool tradition. When we got home, my wife and I talked to our son on Facetime. He was calling us at 9:30 am Sunday from Phuket Thailand. What a treat! He is a teacher and classes start in a couple of days. He seems pretty upbeat. Today, I put the tires on The Mule. Then I took it for a 16-mile test ride in search of brake pads for the rear wheel. The three bike shops I visited were mobbed so I gave up. I’ll pick them up on the way to my volunteering gig on Tuesday night. Next up was painting. I repainted the trim on the refurbished shed. Then I mowed the lawn. Oh, and there was laundry. In all seriousness, thanks to everyone for their well wishes on this blog, Facebook, Twitter, Instagram, and, can you believe it, in person.